Most people have heard of blini, borscht and pirozhki (relatives of the pirogi), but what's the story behind these traditional Eastern European dishes? While vodka, caviar and Crimean sparkling wine found their way onto the shelves of Western European supermarkets a long time ago, Russian cuisine is just starting to be discovered. 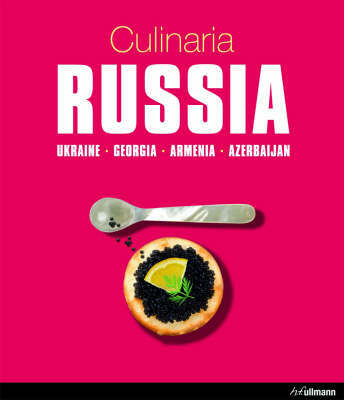 This new book in the popular "Culinaria" series presents an extraordinarily varied and fascinating multi-ethnic cuisine. This book helps you learn about the great variety of Russian appetizers, called pelmeni; how Ukrainian ravioli are made; warenyky, the Georgian national dish, or chatschapuri, the traditional Armenian festive meal; or about Azerbaijan's summer fresh vegetable dishes.In this stunningly illustrated volume, the authors present you with the entire range of cuisine enjoyed in this fascinating part of the world, enticing you to discover new culinary terrain!